If you choose to buy Fairtrade Certified chocolate this Easter (or any other chocolate occasion), you’ll be helping create a better and brighter future for cocoa farmers and their families through the fair price they receive. They also receive additional funds to develop their communities and invest in much needed essentials like education and healthcare. Buying Fairtrade products makes a real difference for farmers and workers in developing countries. Fairtrade is helping producers and their communities build better roads, access health care and send their kids to school. Though the majority of cocoa consumption occurs within the developed world, cocoa is grown mainly in tropical regions of the developing world. An estimated 14 million people in the developing world depend on cocoa production for their livelihoods. In some countries of West Africa and Latin America, cocoa production is the primary income stream. In the Ivory Coast and Ghana, 90% of the farmers rely on cocoa for their primary income. Around the world, 90% of cocoa is grown and harvested on small family farms of 4.8 hectares or less, while just 5% comes from plantations of 40 hectares or more. The number of traders standing between a small farmer and the chocolate found on grocery store shelves is large. 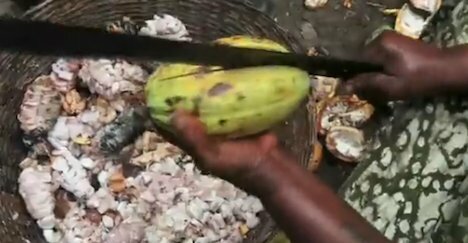 In 2001, the International Labour Organization and other organizations reported widespread child slavery on many cocoa farms in the Ivory Coast, source of 43% of the world’s cocoa. Fairtrade cocoa offers farmers an opportunity to make a real living, as the Fairtrade Standards include a minimum price. A premium is added to the purchase price and is used by cooperatives for social and economic investments such as education, health services, processing equipment and loans to members. The Fairtrade minimum price is paid directly to the producer organizations. When the world market price rises above the minimum price, the market price is paid plus the Fairtrade Premium. Fairtrade cocoa producers are small family farms organized in cooperatives or associations which the farmers own and govern democratically. Environmental standards restrict the use of agrochemicals and encourage sustainability. To see if Fairtrade is available in your country visit the website of your national Fairtrade organization. Previous post: Earth Day: Still Valuable In 2011?